This would likely require a serious reduction in the number of livestock farmed, unless new and untried technologies can be shown to work. Livestock contribute the vast majority of our methane emissions, mostly through belching. The release from the Parliamentary Commissioner for the Environment throws a wrench into an emerging consensus across the country that “stabilising” NZ’s short-lived methane emissions at current levels could be a viable option to stop warming. * What is the NZ Government’s Zero Carbon Bill and will it do anything? It suggests that actual “stabilisation” would still require a reduction in livestock or the success of new methods to lower emissions, such as special feeds, vaccines or tweaking livestock breeding. Climate Change Minister James Shaw is currently consulting on plans for a Zero Carbon Act, which would set some kind of reduction target in law. Parliamentary Commissioner and former National Party Environment Minister Simon Upton is working on a wider report concerning the Zero Carbon Act but decided to put out this research from Andy Reisinger early in order to inform debate. Federated Farmers vice-president Andrew Hoggard said the key point of the report was reductions of 10-22 per cent were needed by 2050, whereas earlier reports before said they just needed to be stabilised. There are three goals for 2050 currently on the table – and none of them consider “no more warming” to be the actual goal. One is exactly what it says on the tin: net zero carbon, but nothing else, meaning agriculture’s “short-lived” methane emissions would be left alone. The second or middle option is net zero long-lived gases, like carbon dioxide and nitrous oxide, and “stabilised” short-term gases, like methane. Finally, the third option is simply net zero for all greenhouse gas emissions by 2050. “To me the report is saying we don’t need to go to complete net zero,” Hoggard said. The middle option of “stabilisation” has attracted a lot of interest but has not yet been made completely clear. The idea behind it is that since methane emissions decay in the atmosphere much faster than carbon, the Government could keep a steady level of methane emissions over time and, because of the drop-off from emissions ten years ago, simply keep the level consistent without contributing much to further warming, recycling the decaying methane with new emissions. About 43 per cent of New Zealand’s greenhouse gases are caused by methane and 11 per cent by nitrous oxide, the first generated by all livestock burping, the latter mainly by cows urinating. The research released by Upton is careful not to suggest policy, but to simply make clear that while methane mostly decays within a decade or so, its lasting effects are such that a significant reduction would still be needed for New Zealand to contribute to no further warming. “It shows that holding New Zealand’s methane emissions steady at current levels would not be enough to avoid additional global warming,” Upton said. Hoggard said if cow efficiency could be improved as it has, and farmers reduced stock, the reductions could occur. “People say cut cow numbers but they have an ideological view of the sector and don’t understand the trade-offs in operating a biological system,” Hoggard said. The research shows that even if stabilised at 2016 levels warming from methane would increase by 10-20 per cent by 2050, and 25-40 per cent by 2100. To avoid this New Zealand would need to reduce livestock methane emissions by between 10 and 22 per cent by 2050 and then 20-27 per cent by 2100. The range of options depends on the amount that other countries reduce their emissions, as methane interacts with other gases in complex ways. 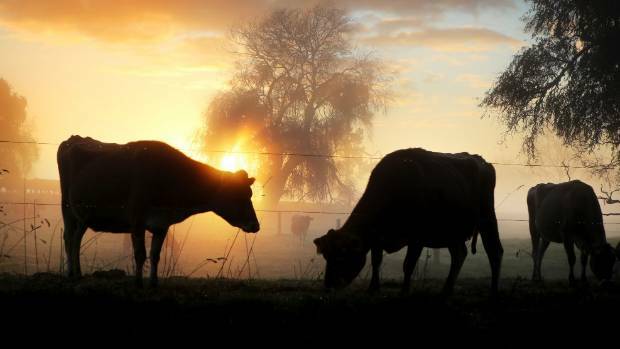 National climate change spokesman Todd Muller welcomed the report, saying it showed New Zealand needed to reduce agricultural emissions by “just” 10-22 per cent. “The research released today shows that reducing methane emissions by just 10 – 22 per cent will mean New Zealand’s methane emissions have a neutral impact on global temperature,” Muller said. Muller and party leader Simon Bridges have made clear they want to work with the Government on setting a target not likely to be changed the moment the Government does. “We are working with the Government to make meaningful bi-partisan progress on climate change. National wants an independent, non-political Climate Change Commission established so we have a framework through which we address climate change issues in the future,” Muller said. Acting Climate Change Minister Eugenie Sage said it was a useful contribution to the policy debate, and the reduction was achievable. “This report shows New Zealand’s methane emissions would need to reduce by about 10 to 22 per cent below 2016 levels (ie the latest year for which emissions data is available) by 2050, with further reductions between 20 to 27 per cent by 2100, if we want to ensure methane emissions from livestock don’t contribute to additional global warming,” Sage said. She noted some in the sector believed the reduction was possible with existing technology. Greenpeace sustainable agriculture campaigner Gen Toop disagreed, saying a reduction in cow numbers was the only viable path forwards. “The dairy industry say there are no easy solutions for reducing methane emissions from ruminants but they deny the obvious solution is to reduce livestock numbers. Fewer cows means fewer emissions,” Toop said. Upton himself said the country and world needed to focus on reducing emissions. “This whole debate started off in the early 1990s and we all said ‘we’re going to plant pine trees in the mean time because we don’t have an easy set of technologies, we’re going to use that time to find the technologies to find a way out,'” Upton said. He said there were encouraging technological breakthroughs, particularly on the carbon side of the issue, but actual reduction would still be needed. Upton expected Governments would make peace with some level of warming from methane emissions, but should aim to get carbon down to net zero. This entry was posted in Climate Change and tagged livestock, Methane, New Zealand by Exposing the Big Game. Bookmark the permalink.